Lately it seems IRA experts are coming out of the woodwork. With an important part of your financial future at stake, you’ll want to be sure you’re talking to an expert who can guide you through the in’s and out’s of this popular investment vehicle. David, how do you know when you’re talking to IRA experts? David Moore: That’s a great question. I guess you have to define what an IRA expert is. Most of the time you’d be talking about investments, which is obviously a totally different subject. If you’re talking about an IRA expert to provide investment advice, that’s going to be one type of person; if you’re talking about an IRA expert that’s going to give you advice on what an IRA can actually do, you’re going to be talking to an entirely different type of person. I would say that IRA Advantage falls in that second category. We don’t sell investments, nor give investment advice. We just give people the opportunity—we provide the investment vehicle for those people to buy what they want to buy. Our expertise is all about application, where typically you’re going to be talking about IRA expertise from the investment perspective. That’s two totally different things. If you want to know what you can buy, give us a call. If you want to know what the return on your investment is going to be, talk to your financial advisor. So, not all IRA experts are the same? David Moore: Certainly not. I would be happy to pass on the question of what investment on Wall Street is going to be great, just like I would expect those financial advisors, when asked about what an IRA can legally buy or how an IRA is going to buy real estate, or how an IRA is going to buy a note or make a loan, they’re not going to be very happy talking about those topics either. You’ve got to understand the question that you’re asking, and then go to the source that’s going to have the information on that. Our perspective has always been one that you don’t want to pay somebody to learn on your behalf, you want to pay somebody who knows. We feel that we’re able to provide answers when people have tough questions on what an IRA can actually invest in. 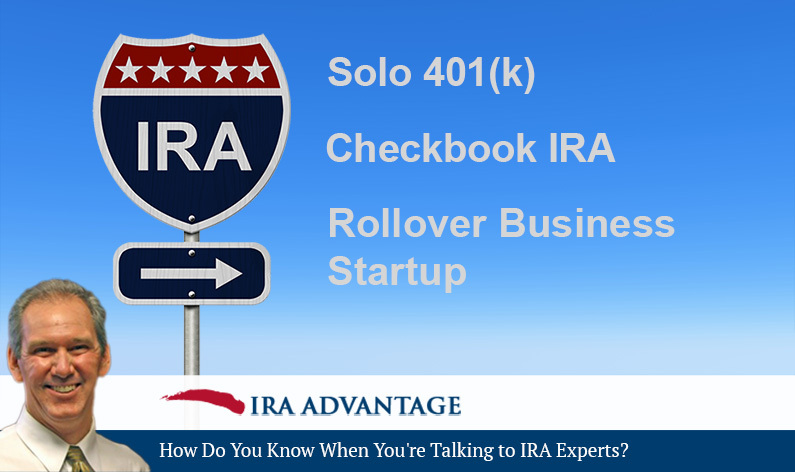 The professionals at IRA Advantage do only IRAs, and they are experts at every aspect of them. Don’t trust your financial future to firms that are less qualified. Call or visit today!